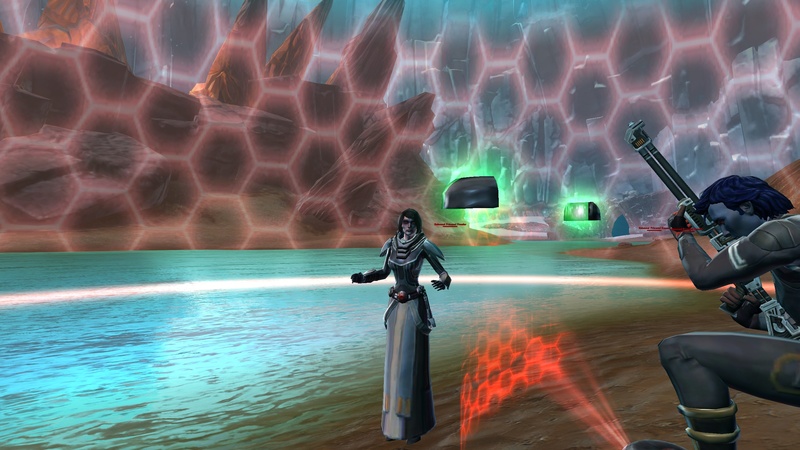 So You Just Hit 50 in SWTOR — Now What? Despite how hell bent some folks can be on getting to 50 quickly, many of those same folks are the ones lolling about on the fleet, asking in chat — “I’m 50 — so where do I go now?” Of course that’s not a simple one-word answer, even though one-word answers are all they’re likely to hear in reply, at best. Where to head to once you’ve hit 50 totally depends upon your max level goals. Do you want to gear up to raid? Or is PvP your focus? Or did you have a sense of obligation to get at least one character to 50 before starting an alt factory? Regardless of your end game goals, there is something waiting for you as a fresh 50. This is a true life quote. And I’m telling you now what I told that person then: go do some dailies! You have two places to head for your dailies: Ilum and Belsavis. Since you’ve already seen the sights of Belsavis, I suggest you head to Ilum first and knock of the introductory mission chain and start in on some of the dailies. Then head to Belsaavis and complete the bonus chain. The comments on the Daily Commendation item on TORhead have a full list of the quests you can do Empire and Republic side, and how many commendations each will net you. Note that some of the more difficult quests have a little sumthin’ extra: various mods for your moddable gear, orange weapon for your companion. You’ll get your daily commendations from running your daily quests on Ilum and Belsavis as noted above. Once you are full up on your commendations for the day, go check out your mission support vendor on Ilum and see what he has to offer. I spent my commendations on additional level 50 mods for my gear, and dream of saving up enough to buy the speeder. PvP tokens are another great way to gear yourself up. Despite dong only a small amount of PvP, I was able to purchase my PvP Champion Gear goodie bag as soon as I hit 50, and had a helm token inside. For more details on how the PvP token earning and spending process works, including an explanation of how Mercenary Commendations are used in conjunction with Warzone Commendations to buy those Champion Gear Bags, check out this post on Gamezone. Last but not least, crafted gear has a lot to offer the discerning max level character. Whether it is haunting the Galactic Trade Network terminal to buy level 50 blues to start, or finding an attractive moddable set to pimp out with your daily commendation mods, or crafting epics you’ve learned from Synthweaving (or whatever your profession may be) crafted gear should definitely not be overlooked. Now that you’re in the groove with your dailies and rolling in cash and great looking max level gear, get cracking on those alts! Every alt you make on your same server, including those of the opposite faction, will immediately start earning you those precious legacy points. Sure, they’re not much more than bragging rights currently, but there are definitely some serious plans in the works for making them a heck of a lot more than that. Congratulations on 50! You’ll be mowing through the Hard Mode Flashpoints and max level PvP and Raids in no time!